On your first visit to our office, the team will welcome you to the office. We will ask you to fill out patient forms for yourself or your family. Our team will be able to help you and answer any questions you may have. If you would like to save 15 minutes of your time in our office, you can print the forms and fill them out at home by going to the Patient menu and clicking "forms". Dr. Brian or Dr Ly will be going through a discovery process with you on your first visit. This part of the visit is geared at learning about your health concerns, healthcare goals, expectations, and if Chiropractic is a good fit for you. After the consultation, the Doctor will preform a Chiropractic exam. He will analyze your posture, your spine, and the function of your nervous system. If the Doctor feels X-rays are necessary, they will be taken at this point. These scans are the single most important part of your first visit in our office. The scans give us a picture of how your Master Control System (your Nervous System) is working. This technology is certified by the Space Foundation and used by NASA. These scans will also allow us to track your progress in our office. This is the end of your first visit. The Doctors ask that you come back either later that day, or the next day to discuss the results of the exams and scans. Dr. Brian reviews each case and discuss them with each other to create the best Care Plan to help you reach your health care goals. On your second visit to the office, you will be welcomed back to the office and reminded of what will happen today. Today is the "Answers" day. Dr. Brian or Dr Ly will let you know if we found what we were looking for, if we can help, and what the commitment will be. Most importantly, you will find out if you are a candidate for Chiropractic. 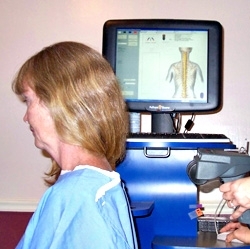 The Doctors will discuss your scans with you and talk with you about receiving your first adjustment in our office. If you have any questions, ask Dr. Brian,Dr Ly or any team member.